This article takes an anthropological approach to examine the role of fetishisation as a means of control in the context of Disney’s Moana. To appeal to its primarily Western target audience, Moana fixates on easily accessible iconography while ignoring the cultural significance behind that iconography, making bodies and symbols into fetishes to draw the viewer’s attention. Soft primitivism is an extension of neoclassicism, and the portrayals of characters’ genders in Moana are heavily influenced by neoclassical ideas of Greek aesthetics. Gender roles constructed through a Western lens are layered onto representations of Polynesian peoples, stressing the physicality of men and the exotic nature of women (Worley, 2012). The two main male characters in Moana, Maui and Chief Tui, are characterized by caricatured musculature and simplistic intellect: Maui is childish while Chief Tui is xenophobic. The physical representation of these characters shares many similarities with early European depictions of indigenous Pacific peoples. Compare the features of Moana’s Maui and Keate’s Portrait of Abba Thule (fig. 1). Western colonial depictions represent preconceived notions of indigenous peoples which were informed by Enlightenment thought. By reducing cultures to a primitivist utopia they become romanticized, distorting true representations by fixating on Western ideals. The Noble Savage paradox is shared in Western depictions of other marginalized indigenous cultures, for example Benjamin West’s The Death of General Wolfe – depicting an indigenous American man posing in a similar manner to Rodin’s Thinker to emit a sense of deep thought, albeit hyperbolically adorned with cultural markers which clearly separate him from the European men around him (Fryd, 1995). A fetishised culture cannot be fairly represented because fetishisation is the act of obscuring some features to fixate on others. Moana depicts a fetishised form of indigenous Polynesian culture. In its appeal to Western audiences, it distorts and obscures important cultural practices. Even ritual practices which appear on screen for a few short seconds, such as the establishing shot of men ploughing a field for kumara plantation, are expressed in a way that draws the viewer to their otherness. 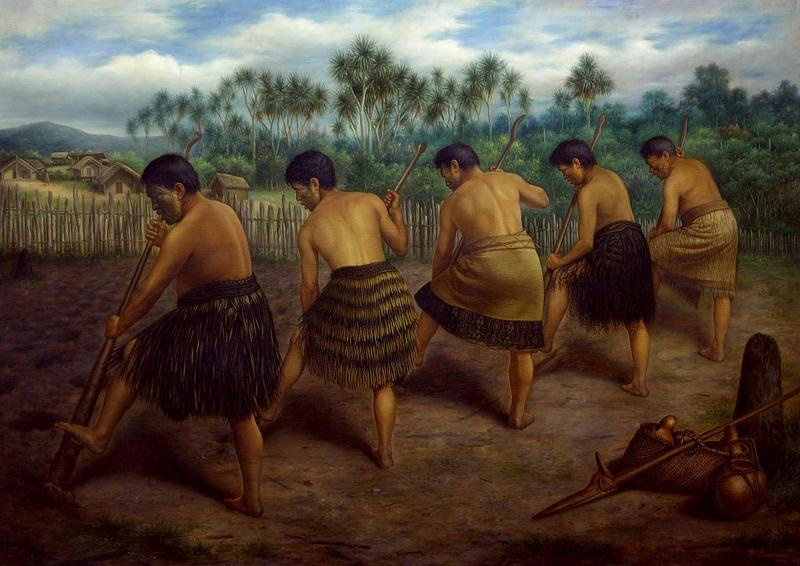 In an image which draws heavily from Gottfried Lindauer’s Digging with the Ko (1907), five men wearing clean tapa cloth skirts prepare a field for kumara plantation (fig. 2). The focus is taken away from the act, which carries immense significance in Maori culture (Yen, 1961), and focuses instead on the men performing it. The exotic aspects, the tattoos, and the men’s physicality highlight the soft primitivist ideas put forward by the film. In doing so, they distract from this important cultural ritual, fetishising the bodies of indigenous Polynesian men. Moreover, it is important to note the gendered portrayal of tattoo and its role in the film’s fetishisation. Of the dozens of women shown in the film, only two female characters have any visible tattoos. Being agents of the film’s plot, one must account for the contrivances of the medium. The small wrist tattoo of Sina, Moana’s mother, acts as a visual focal point for a single brief shot. The large manta ray on Gramma Tala’s back is a setup for a visual callback later in the film (fig. 3). Both tattoos on women in Moana act not as cultural symbols, but mechanisms of visual narrative. There are no tattooed women in Moana, only women who have tattoos. Much like the motif of kumara agriculture, all cultural weight associated with the practice of tattoo (Keown, 2004 pg. 60) is stripped and trivialised into a visual which conforms with Western filmmaking ideals of composition and narrative. To commodify Polynesian culture, indigenous practices are reduced to decontextualized motifs in Moana. Fryd, V. G. (1995). Rereading the Indian in Benjamin West’s “Death of General Wolfe”. American Art, 9(1), 73-85. Keown, M. (2004). Postcolonial Pacific Writing: Representations of the Body. Oxford, UK: Routledge. Yen, D. E. (1961). The adaptation of kumara by the New Zealand Maori. The Journal of the Polynesian Society, 70(3): 338-348. Richard Myburgh is currently completing a conjoint degree in Arts and Science, majoring in Anthropology. This article is a shorter exerpt from a larger term paper on representations of gender and the Pacific.